• Works great as paperweight, bookends, conversation starters and more! 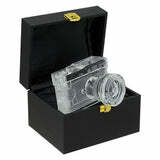 This beautiful crystal camera is a great item for Photography lovers. This hand carved crystal is designed to look like the popular Hasselblad 503CM w/ 80mm f/2.8 CF Lens. The crystal camera is well made and is very detailed, with etching to representing various buttons and dials. The lens, handgrip, viewfinder, rear screen, and a couple of knobs are made of separate pieces of crystal and are attached to the main body. It comes with a beautifully made, fabric lined box complete with cushioned inside, making this item a wonderful gift idea. Fantastic for displays, bookends, paperweights and more!